I love teh tarik plus roti canai that for sure. 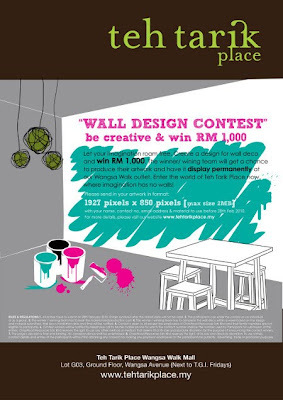 Anyway, Tehtarikplace is having a contest which is open to everyone were your task is creatively create a wall design for their outlet at Wangsa Walk Mall . Winner will have their own design being permanently displayed at the Mall plus RM 1,000 cash to top it up. So airborne there now ! Let your imagination run free!